Sang Hoon Degeimbre of two Michelin star L’air du temps in Liernu, Belgium describes himself as Korean born, a Belgian man and citizen of the world. This is another great story of a chef who followed his passion. He started working in restaurants as a sommelier and as he himself says, the first time he cooked in a restaurant was on the opening night of his own restaurant. A self-taught chef, Sang Hoon’s story is an inspiring one of someone who fought against all odds to follow his passion and open a restaurant. But his restaurant is not just a run of the mill restaurant. Sang Hoon is known for his innovative dishes and a trip to the restaurant is considered a culinary pilgrimage. It has always been my wish to dine at his restaurant since my arrival in Belgium but for some reason or another this has never materialised. After listening to his story at Chefs Revolution in Zwolle last month, I am sure that the time has come to visit this temple of experimentation very soon. Sang Hoon opened his restaurant in 1997 and since then it has been a constant evolution as he himself says. 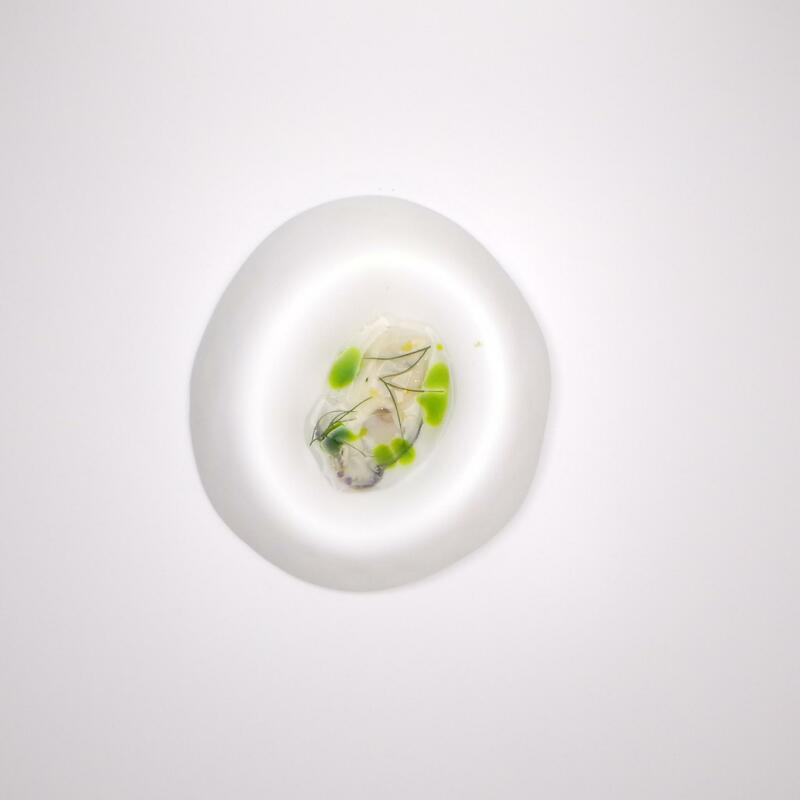 From that day, he has moved to the top of the Belgian culinary world and is considered to be the fifth ranked among the best Belgian restaurants. Korean born, he moved to Belgium when he was five years old and was adopted by a Belgian family. Originally he wanted to be a pharmacist (and that is visible from his cooking style as we shall see later) but his passion was food and cooking and since he could not find a job as a chef, he decided to learn skills as a butcher knowing that creating something with his hands might lead him to pursue his dream of working in the kitchen. “No one wanted to give me a job in a kitchen,” Sang Hoon said “so I went to the wine industry instead. I fell in love with wine when I was 18 after tasting a Burgundy Chassagne Montrachet,” he said. His mantra is to observe, listen, absorb and understand. “When I opened my restaurant in 1997, I had never cooked before except for friends at home. I cooked for the first time on the opening night and since then I have been cooking for 17 years,” he says. Sang Hoon says that his time as a sommelier has helped him to develop his cooking style. As a sommelier he had to consider the details of each wine he tasted and pair it with food. In his cuisine he started with the produce and then uses techniques to create emotions. In 2000, L’air du temps created a garden. “A banker I knew wanted to follow his dream and grow vegetables. We worked on this together and step by step we created a link between the garden and my cuisine,” he said. Sang Hoon said that with the garden they decided to start following the seasons and used whatever was available in the garden. He uses the produce from his garden but says he works with around 20 producers who bring him butter, beef, lamb and other ingredients used in his restaurant. “I am Belgian but Korean born and therefore I need to be open to new ideas,” he says. Since he opened his restaurant he says he has made lots of mistakes. “In this field you lose some and you win some,” he says. Given that he has his own garden which produces vegetables and fruits, Sang Hoon says that he had to find a solution for excess vegetables. What they do is preserve them. The preserved carrots we tried after his presentation were excellent. They were crisp and still fresh thanks to the way they were preserved. He also uses an ultrasound machine to create flavoured water which accompanies every dish he presents at his restaurant. On top of that, he also creates a non-alcoholic ‘wine’ using this machine. To water he adds muscovado sugar, juniper seeds, crushes red fruits to get the red fruit flavour, cloves, some pepper, raspberries and citric acid for acidity. For tannins he adds leaves from the garden. He also creates a water with tomato and basil. Sang Hoon recalls how he was very emotional when he returned to Korea. There, he learned the art of preservation and fermentation. He says that the Korean way of fermentation has helped him to ferment his produce. “We create our own bacteria for fermentation using vacuum bags and then we preserve our carrots from spring which can be used in autumn. In this way, we ensure that there is no waste. These can be preserved for up to 3 years,” he says. “This is a model being used by many chefs nowadays.” He also preserves oysters and scallops for months to create his own umami tastes. Sang Hoon spoke about the importance of the staff particularly to be able to tell the story of a particular dish. He said it was crucial to learn the basics and have a deep knowledge and understanding of the produce. “I am self-taught but I met many people who helped me develop along the way. You need to have an open mind and to meet as many people as you can. I don’t know how my cuisine will evolve in future. But what I know is that I want to learn more and to taste more. For me cooking is about art, biology and gastronomy. It is the richest job in the world,” he says.